A war action movie, Rambo III moves the series to Afghanistan, but otherwise offers more of the same implausible high body count carnage. Colonel Sam Trautman (Richard Crenna) seeks out John Rambo (Sylvester Stallone) in Thailand and tries to convince the ex-Green Beret to join a secret mission into a dangerous part of Soviet-occupied Afghanistan. Rambo refuses, but when Trautman proceeds with the covert assignment anyway and is captured and held prisoner by the brutal Russian Colonel Alexei Zaysen (Marc de Jonge), Rambo volunteers to embark on a one-man rescue operation. 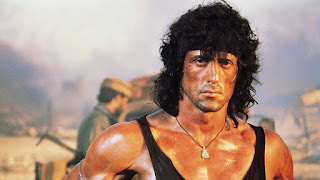 Entering Afghanistan through Pakistan, Rambo connects with local Mujahideen, and witnesses first hand the brutality of the occupying Soviet forces. With Trautman enduring torture, Rambo has to move quickly to invade Zaysen's fort and attempt a dangerous extraction. After the success of Rambo: First Blood Part II, another sequel was inevitable. But whatever heart and soul was pumping through the series in 1985 was spent by 1988. With the Soviet Union showing signs of both openness and collapse, geopolitical timing did not help the film. By the time Rambo III was released attitudes towards the Soviets were shifting, and the bloodthirsty screen villains did not mesh with the Gorbachev era. None of which would matter to John Rambo. Plonked down into a different war theatre than his own, the muscular killing machine just goes through the motions with a surly attitude and a dour set expression. Rambo was forged by the jungles of southeast Asia, and the visceral connection just isn't there in the barren landscape of Afghanistan. Director Peter MacDonald, working from a script co-written by Stallone, tries to inject human drama and emotion into the proceedings with a couple of preachy passages ramming home the plight of Afghani villagers and civilians, with an obligatory smart-alecky orphaned child thrown in for good measure, but it's all too textbook rather than organic. What's left are prolonged action sequences featuring endless explosions, plenty of hardware (the Hind helicopter a particular favourite), and the usual incredible escapes and one-against-many odds that Rambo thrives on. The mayhem is well executed, Stallone gliding through the battlefields with the practiced precision of the hero who will always find a way, no matter the gravity of the situation. Crenna's Trautman gets a larger role this time, acting as both the primary mission objective and later a capable combat partner. You can take the warrior out of the jungle, but you can't take the jungle out of the warrior. Rambo III goes looking for new wars, but barren dust is a poor substitute for thick foliage.